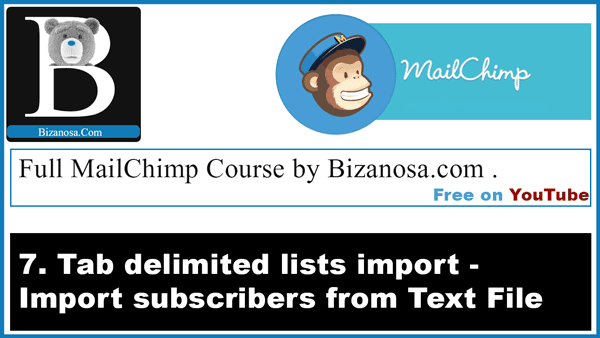 If you have been following this Mailchimp series from the beginning, you can recall, we have imported a simple list, we have edited a subscriber list. The next thing is to create a new Mailchimp list. And explore Tab Delimited Lists . This is a list with Multiple fields eg it may have an Email, First, Last Name etc . This is the kind of list you will learn to import into your account. First I will create a List . I will go to Lists ( click on Lists on the Menu Tab ). I will create a new list by clicking on the Create List button. Fill in the Details for the new List. List name : You have to give the list a name. Default “From” email : What will subscribers see as the sender email for the sent newsletters. This one is mandatory . Default “From” name: Who is the sender of the email. This one is mandatory . Remind people how they joined the list. What we want to do is import a list. The List will have extra Fields. The list will have a First Name, Second Name, a Location and Title. Once you create the list. Click on Import Subscribers . This is under the You have no Subscribers message in the middle of the page. I am assuming you already have your list. Click on Import from CSV/TXT file . Then Browse for your list and then click the “Upload List” button. The next step involves matching the columns in your uploaded list to your mailchimp List. You will see that each item that was delimited by a Tab/space becomes its own Field . The Email became a Field, the First Name became a Field, and the second Name also became a Field. Mailchimp will create an unnamed Title for them. Your job is now to label the titles based on your imported list. You will click on “Edit” this. Do not click on Skip . When you Click on “Edit” then you make a selection. You will see there is an option to “create a new column”, then give the “New Column Name” . Or you can choose one of the available columns. As in the video above, I will choose the “New Column Name” . I will match the First Name with the names for my uploaded list. Then click on “Save” …. Do the same for all the other fields until they have all been matched. Then click on the Complete Import button. If there are any columns in your list that you do not want. You can delete them as shown in this edit lists columns tutorial . To delete a column, just go to “settings” click on “List Fields and *|MERGE TAGS|* “. Click on the delete icon next to the field you want to delete. Then confirm deletion by Typing “DELETE”. Then Click on “Save Changes” . To go back to your list click “Manage Subscribers” … then ”View Subscribers”. We’ve been able to import everything in a very simple way by just using a TXT file and then editing once we imported them. Thanks, until next time .